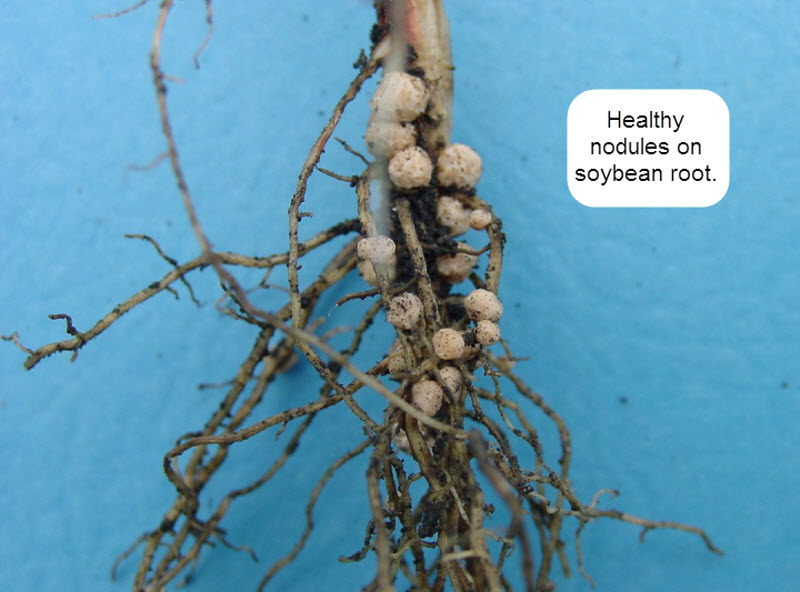 In a recent issue of the Soy Report, Dr. Shawn Conley tackles the four most common questions he has about nitrogen nodules from Wisconsin farmers. This season’s over abundant rain and lack of sunshine and the pale green color of crops in the field have growers on edge. Hopefully, these answers will clear up some of these concerns. Why is nodulation such a problem this year? Abiotic stress such as low pH (≤ 6.0), saturated or droughty soils and cool soil temperatures can negatively impact nodulation (Valentine et al. 2011). Duzan et al. (2004) reported that root hair deformations (a physiological precursor to rhizobia infection and nodulation) was 64 and 82% of the control when rhizosphere (root zone) temperatures were 59 and 63 degree F when compared to 77 degrees F. This suggests that the cool soil temperatures we have been experiencing have likely limited the infection sites available for nodulation to occur. This effect has likely been exacerbated in no-till or compacted conditions. In short less nodulation sites on the roots means increased likelihood for less nodules. If you’re interested in Dr. Conley’s sources for his thoughts, you can find them here.